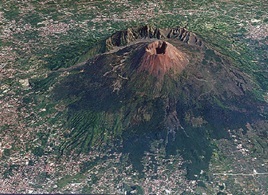 Vesuvius has erupted many times since and is today regarded as one of the most dangerous volcanoes in the world because of the population living nearby and its tendency towards explosive eruptions.The area around Vesuvius was officially declared a national park on 5 June 1995. The summit of Vesuvius is open to visitors and there is a small network of paths around the mountain that are maintained by the park authorities on weekends. 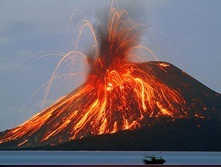 Krakatoa, also known as Krakatow, is another still-dangerous volcanic island, located in Indonesia in the Sunda Strait. In August 1883, there were a series of extremely violent gigantic explosions with a force 13,000 times larger than the Hiroshima bombing. The catastrophic explosion which could be heard as far away as Perth in Australia, spewed over 21 cubic kilometers of rock, ash and pumice up to 70 miles high. Officially, over 37,000 people were killed, mainly due to resulting tsunamis, although the actual death toll is thought to be much larger. 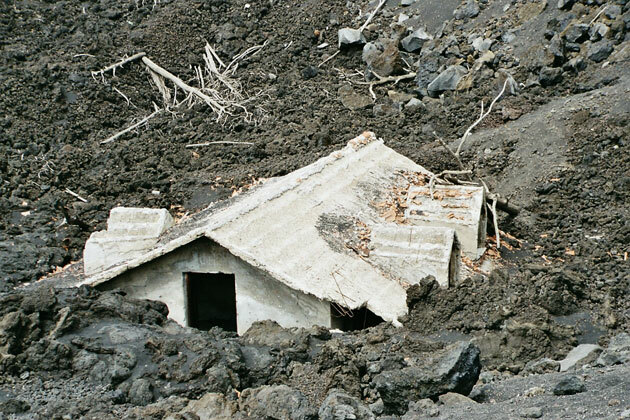 The 1928 eruption of Mount Etna volcano, Sicily, and the destruction of the town of Mascali. 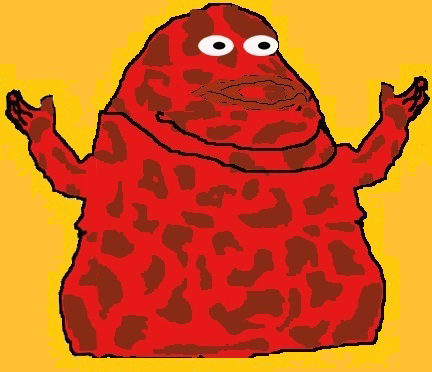 Duncan AM, Dibben C, Chester DK, Guest JE. In November 1928 there was an eruption of Mount Etna, Sicily, which led to lava largely destroying the town of Mascali, situated low on the eastern flank of the volcano. Destruction of the town took just over a day but there was an orderly evacuation of its inhabitants and, with help from the military, families were able to remove furniture and fittings from their houses. Evacuees were relocated to nearby towns staying with relatives, friends or in hired apartments. Rebuilding Mascali provided an opportunity for the fascist government of the time to demonstrate efficient centralised planning. A completely new town was built on a grid-iron plan with many of the buildings reflecting the 'fascist architecture' of the time. The town was complete by 1937 and housing condztzons were very advanced in comparison with other towns in the region. The 1928 eruption is important as it was the most destructive on Etna since 1669 when the city of Catania was overwhelmed. In terms of hazard and risk assessment the 1928 eruption demonstrates that lava can reach the lower flanks of the volcano within a short period after the onset of an eruption. 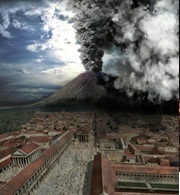 The legacy of Pompeii and its volcano. de Divitiis E, Cappabianca P, Esposito F, Cavallo LM. Department of Neurological Sciences, Division of Neurosurgery, Università degli Studi di Napoli Federico II, Naples, Italy. On August 24, AD 79, a terrible eruption of Mount Vesuvius deranged life in beautiful Pompeii and killed thousands of men, women, and children. They were restored to us by the fact that Mount Vesuvius, with its rain of ashes, proved to be a skilled sculptor, preserving the shape and even the wrinkles in the clothes the Pompeians wore while trying to escape during the day of the tragedy. The detailed description of Plinius the Younger and modern static studies of the eruptive residues have made it possible to reconstruct with great accuracy the various phases of the eruption that took place 2000 years ago, including the hours and days during which the phenomena first became obvious. Today, almost 2000 years later, Pompeii has reawakened and risen from its sepulcher of ashes thanks to the excavations initiated under King Charles III of Bourbon in 1748. Excavations proceeded slowly under the Bourbons, with the aim of enriching the Bourbon Museum of Naples rather than of classifying the ruins and placing them into a historical context. Under Joachim Murat, interest in the town planning and architecture of the uncovered cities reemerged, especially with respect to Pompeii. In 1860, however, with the establishment of the Kingdom of Italy, the excavations, now under the direction of archaeologist Giuseppe Fiorelli, were provided new impetus and, finally, a scientific basis. Today, the excavations are giving us back extraordinary evidence concerning the culture, the everyday life, the habits, the architecture, and the wonderful frescoes of the Roman cities of southern Italy, making possible the statement that Pompeii is "the most alive of the dead cities." 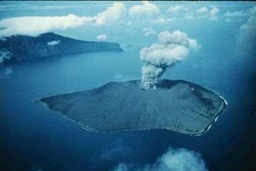 Global science: the eruption of Krakatau. Université Louis Pasteur, IRIST, 7, rue de l'Université, 67000 Strasbourg, France. The eruption of the volcano Krakatau in the Netherlands East Indies (Indonesia) in 1883 had worldwide impact. This was perceived in the three quite different types of global propagation that occurred after the eruption: a rapid pressure wave, noticeable only to measuring instruments, followed a few hours later by the spread of the news of the event, succeeded by a slowly expanding optical phenomenon that lasted for a couple of years. Krakatau was the first natural catastrophe of global magnitude that was almost immediately recognized as such throughout the world, largely thanks to the recently installed worldwide telegraphic network. Upward migration of Vesuvius magma chamber over the past 20,000 years. Scaillet B, Pichavant M, Cioni R.
CNRS/INSU-Institut des Sciences de la Terre d'Orléans, 1a rue de la Férollerie, 45071 Orléans, cedex 2, France. Forecasting future eruptions of Vesuvius is an important challenge for volcanologists, as its reawakening could threaten the lives of 700,000 people living near the volcano. Critical to the evaluation of hazards associated with the next eruption is the estimation of the depth of the magma reservoir, one of the main parameters controlling magma properties and eruptive style. Petrological studies have indicated that during past activity, magma chambers were at depths between 3 and 16 km (refs 3-7). Geophysical surveys have imaged some levels of seismic attenuation, the shallowest of which lies at 8-9 km depth, and these have been tentatively interpreted as levels of preferential magma accumulation. By using experimental phase equilibria, carried out on material from four main explosive events at Vesuvius, we show here that the reservoirs that fed the eruptive activity migrated from 7-8 km to 3-4 km depth between the ad 79 (Pompeii) and ad 472 (Pollena) events. If data from the Pomici di Base event 18.5 kyr ago and the 1944 Vesuvius eruption are included, the total upward migration of the reservoir amounts to 9-11 km. The change of preferential magma ponding levels in the upper crust can be attributed to differences in the volatile content and buoyancy of ascending magmas, as well as to changes in local stress field following either caldera formation or volcano spreading. 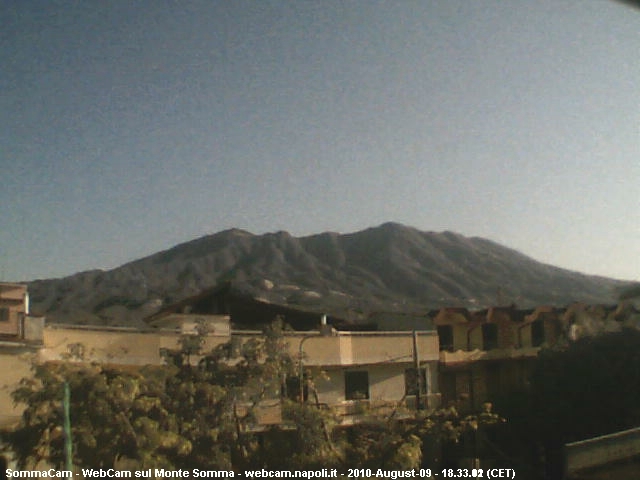 Reservoir migration, and the possible influence on feeding rates, should be integrated into the parameters used for defining expected eruptive scenarios at Vesuvius. Differing from Pompeii being destroyed by Mount Vesuvius in 79 AD Mount Etna s eruption in 1928 destroyed the town of Mascali but did not kill its inhabitants. The military helped the townspeople evacuate to nearby towns. An effect of rebuilding towns and roads after volcano eruptions is that it gave the government and people an opportunity to improve the town, its structure and its buildings.